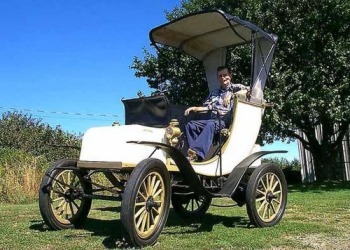 Oliver Fritchle established the O. P. Fritchle Garage Company in Denver, Colorado shortly after being granted his first battery patent in 1903. The new firm specialized in sales, maintenance, and recharging of electric vehicles, but also represented gasoline powered lines such as Hammer. He began developing and manufacturing better batteries in order to enhance the range, performance, and durability of his customers' vehicles, but found automobile technology the more limiting factor after several years of battery improvements. The Fritchle Automobile & Battery Company was established by 1908 to manufacture vehicles of his own design and by 1917 he was qualified as one of the few automotive engineers in Colorado. His first design halved the power consumption, nearly doubling the range, relative to competitors' vehicles. One contribution to this advantage was his successful implementation of what was known then as "electric brakes" and more recently as regenerative brakes. The concept of using the motor to recharge the batteries while slowing an electric vehicle was not new even as early as 1908. However, implementing it effectively in automobiles and trucks was still quite tricky with the technology of the period and required development of a proprietary controller. 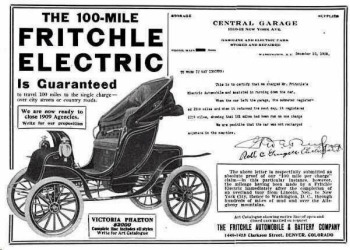 Fritchle produced a number of practical innovations in addition to his battery and vehicle patents, such as one of the first automobile child seats. 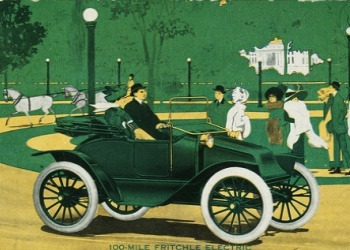 The Fritchle Milostat was a clever solution to the problem electric vehicle operators had accurately estimating the driving distance available from their batteries. It was simply a hydrometer calibrated to display the percentage of charge remaining rather than the normal, but difficult to interpret, specific gravity reading. 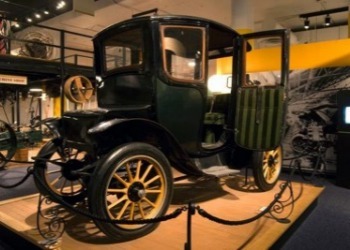 The Fritchle Automobile products evolved over five years from the carriage-like Phaeton to a broad line of cars and a commercial truck. Models made at various times during more than a decade of production included the Victoria Phaeton, four-passenger coupe, roadster, Stanhope runabout, two-passenger torpedo runabout, four-passenger tourer, a luxury five-passenger brougham, and a one thousand pound commercial truck. Fritchle took steps to establish a company presence in Washington, D.C. at the end of his 1908 cross-country trip. Additional efforts to expand into the lucrative East Coast market were made in 1912 with the opening of a sales office on Fifth Avenue in New York City and selection of a manufacturing site in Bridgeport, Connecticut as the International Fritchle Company. However, these did not pan out and Fritchle Automobiles remained primarily a small regional manufacturer through the end of production.